Large independent apartment in old farm réstaurée. South facing position and west entrance through large covered terrace overlooking the living room, fully equipped kitchen, dining area and lounge with TV .this same room giving it access to 2 bedrooms each with its own shower room and toilet. Sit out on the terrace overlooking the pool and enjoy the view over the valley. Apartment in restored farmhouse with large pool (6x12x1. 30et 2. 30) with alarm. You can enjoy your garden and barbecue under the covered terrace, direct access to the pool. at your disposal: beach beds, shower and parasols. Pleasant stay guaranteed in calm and conviviality while discovering our beautiful region: (medieval villages, wineries and local gastronomy.From the property you can discover many hiking trails in heart of vines and woods. Rentals located 20 km from Albi, magnificent city declared Heritage of Unesco .Come admire its cathedral, a fortress of the 13th century, the Toulouse-Lautrec Museum or simply stroll through the shopping streets of the old Albi Go to the discovery of medieval villages also loaded with history and if you like all that is good for the palate, our local gastronomy and wines from Gaillac await impatiently ..
2 water rooms with shower, sink and toilet. Enca and fully tiled. 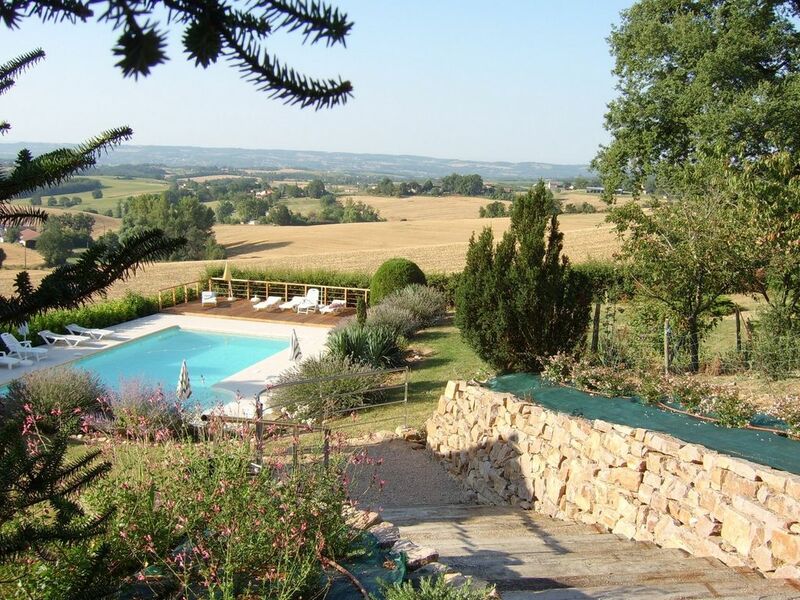 in the heart of the Tarn, the milieu of the Gaillac vineyard, on a quiet hillside, 5 minutes of autauroute A 68 dir. TOULOUSE, 60 km ALBI or 20 km. Our little village of Cadalen is 2.5 km from us; there you will find all conveniences for first .then you Gaillac 9 km to the greatest needs. from the cottage you apréciereznos many marked trails that'll take you up among others to our little village Técou or if you want you will enavez the 1 gratiute wine tasting our wine cooperative open daily.